What, exactly, is Jewish food? Some would say it's any food eaten by Jews, and/or any food that's kosher. But that's arguably a major oversimplification, and one that ignores the notion that Jewish food, taken as a whole, is an amazingly diverse, international, diaspora-driven cuisine. For many, it's the foods of one's own culture (i.e. Ashkenazi, Sephardi, Mizrachi, etc. )–especially traditional Shabbat and holiday fare–that registers as specifically "Jewish." But it would take an encyclopedia (at least!) to cover the true breadth of Jewish cookery and food traditions. In fact, The Encyclopedia of Jewish Food, by the esteemed late food historian Rabbi Gil Marks, is a great resource for exploring the subject. Cookbooks, too, can offer lots of insight into–not to mention the chance to taste–the best of Jewish cuisine. To get you started, here's an overview of some iconic dishes, along with information on the common threads between them. Yemenite Jachnun with eggs and red zchug. Excerpted from Breaking Breads by Uri Scheft (Artisan Books). Copyright © 2016. Photographs by Con Poulos. Jachnun, a buttery Yemenite bread that is cooked overnight and served for Shabbat lunch with tomatoes and the fiery condiment z'chug. 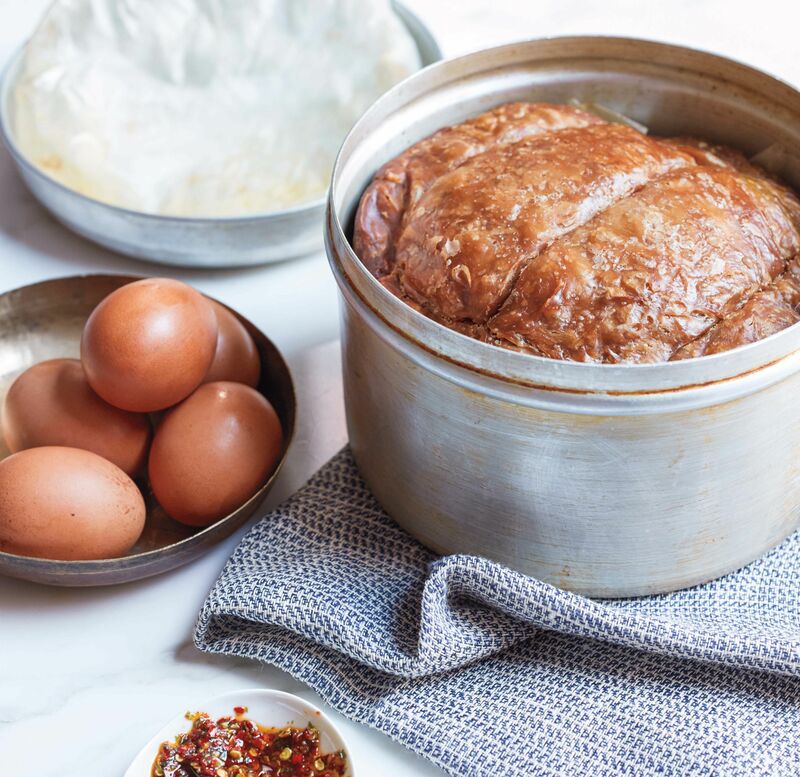 Kubaneh, another slow-cooked Yemenite bread, has a pull apart style, and is sometimes beaked with whole shell eggs. Dabo, a honey-sweetened, spiced bread enjoyed by the Beta Israel Jews of Ethiopia on Shabbat and holidays. While the injera eaten during the week is made from teff flour, dabo is made from wheat. Matzo, a simple two-ingredient unleavened bread, is Passover's iconic bread. (If you think of it as a giant cracker, note that the original matzo was very likely a pliable, laffa-like bread, and that some still maintain the custom to eat so- called "soft matzo." As for everyday breads, pita, bagels, bialy and malawach (a Yemenite bread that's popular in Israel) are among those closely associated with Jewish foodways. Chopped liver became popular thanks to the Jews of medieval France, who raised geese for schmaltz (cooking fat), and subsequently made use of the fattened livers. (The French delicacy foie gras originated from this endeavor.) Today, chopped liver is typically made from chicken or beef liver. Carciofi alla Giudia, or Jewish-style fried artichokes, are a Roman Jewish dish still popular in Italian eateries. Artichokes, which are discussed in the Talmud, were considered a "Jewish" vegetable, and it was thanks to preparations like this that non-Jewish Italians adopted them. Ironically, fresh artichokes have fallen out of favor in many Orthodox Jewish communities, thanks to worries over insect infestation (most bugs are not kosher). Pickles of all sorts are popular throughout the Jewish world. Garlic dill cucumber pickles are an Ashkenazi specialty, while amba, or pickled curried mango, spread from the Jews of Bagdhad to Iraq. Spicy pickled cauliflower is popular in Israel, while olives, which are essentially cured via pickling, have special significance as one of the Seven Species of Israel. Gundi, a Persian Jewish specialty, are spiced dumplings made from chickpea flour and ground chicken or turkey. They're served as appetizers, or added to soup. Other popular appetizers include dips such as hummus, matboucha and baba ghanoush, filled savory pastries such as bourekas and knishes and gefilte fish or smoked fish. Cholent, though closely associated with Eastern European Jews, likely originated in France. This savory, stew-like dish typically includes beef, barley, potatoes and beans. There are lots of variations on dafina, the Moroccan Shabbat stew. Beef and chicken, potatoes, chickpeas, in-shell eggs, dates, rice and barley or wheat berries are among the traditional inclusions. Tabeet is an Iraqi Jewish dish of rice-stuffed chicken that's slow cooked in a bed of more rice, spices and in-shell eggs. Doro wot, the national dish of Ethiopia, is also the preferred Shabbat stew of Beta Israel Jews. The recipe includes chicken, onions, whole in-shell eggs and spices including the distinctive blend known as berbere. 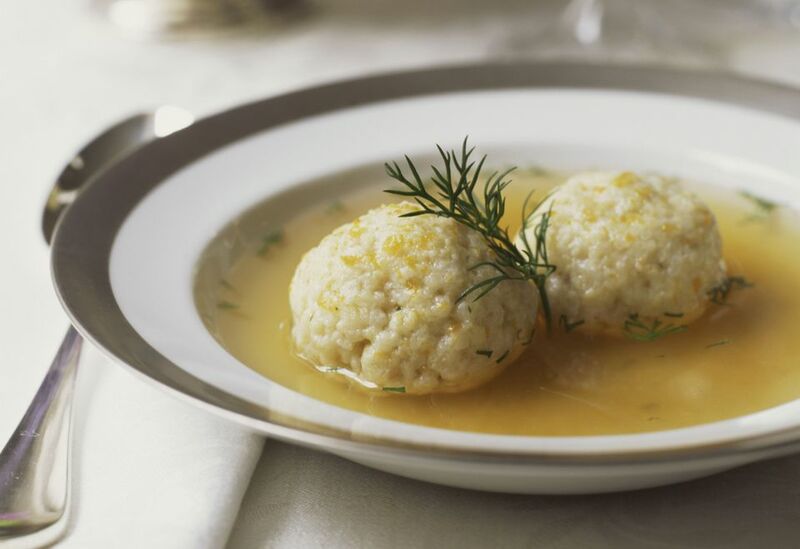 Matzo ball soup, an Ashkenazi classic, made with chicken broth and matzo meal-based dumplings. Schav, a sorrel soup, and borscht, a beet based soup, are two seasonal Eastern European favorites. Harira, a lentil-based soup with pasta and sometimes meat, is enjoyed by Moroccan Jews, and is often used to break (or sometimes start) a fast, such as Yom Kippur or Tisha B'Av. Gundi, a Persian soup, features a piquant chicken broth with chickpea and chicken dumplings. For holiday and Shabbat meals in particular, meats are often features as the centerpiece of the meal. Iconic dishes in the Ashkenazi world include roasted or braised meats, such as brisket. Stuffed cabbage may be served as an appetizer or main dish. Chicken dishes, too, are a near universal for Jews around the world. And in coastal and Mediterranean communities, fish is prized as well. Moroccan tajines, and Persian khoreshts, stew-like dishes that often combine vegetables and meats, are also classics. Vegetables and grains of all types make their way into prized side dishes. For Ashkenazim, kugels of all stripes are iconic sides. Kasha Varnishkes, or bow ties with toasted buckwheat groats, is another classic comfort food. Tabouli, chopped vegetable salads, couscous, tajines and many dishes that can do double duty as appetizers or main dishes are fixtures in Sephardi and Mizrahi cuisines as well. Traditional holiday dishes tend to vary among Ashkenazi, Sephardi, and Mizrahi Jews. But in certain key cases, there's almost surprising commonality. For instance, during the holiday of Passover, matzo is universally iconic, as is charoset, a fruit and nut paste that's vital to the Seder meal. There are, of course many variations on charoset, which reflect both ingredient availability and the dominant cuisine. But the charoset itself is a constant, which is not the case with other holiday foods. For instance on Purim, Ashkenazi Jews favor hamantaschen, while Sephardim opt instead for deep fried dough meant to represent Haman's ears. On Rosh Hashana, Ashkenazi Jews may eat honey or prepare tzimmes to ensure a sweet new year, while Sephardi and Mizrahi Jews may enjoy a Seder-like succession of symbolic foods. Latkes are a must for Ashkenazim on Hanukkah, while Greek Jews may opt for Loukoumades. Modern Israel is arguably the ultimate soup pot when it comes to diaspora cuisine–as home to Jewish communities that hail from around the globe, concentrated in a small country, there's lots of culinary exchange, both among Jews and between Israelis and their Arab neighbors. Iconic foods include falafel, shakshouka and bourekas, condiments like tahini and zchug, dairy items like labneh and gvina levana, spices like za'atar and sumac. And the famous Israeli breakfast is an icon of its own. Sweets of all sorts are enjoyed on Shabbat and holidays, which has helped transform them into iconic treats. Some are holiday specific, like hamantaschen and sufganiot. Other famed sweets include rugelach, babka, maamoul, the Persian chickpea cookies known as Nan-e Nokhodchi, the so-called Jewish Apple Cake, halvah and the Middle Eastern pudding malabi.